Barbecue suitable for your build in project. These BBQ's allow you to design your own outdoor living space and create outdoor kitchens to cook and entertain your friends and family. Carefully planned they can extend the barbecuing season well into Winter and even a Christmas BBQ. 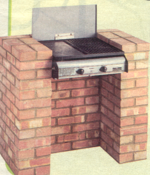 Easily fits into masonry barbecues to convert to gas. 2 separate quality cast iron grills half flat plate half grill. Includes rain cover lid and lava rock. Supplied with BS Hose & Regulator. Dimensions: width 55 X depth 57cm.